Sydney surroundings are unbeatable. I am still amazed that such a metropolis has one of the most beautiful natural wonders of Australia around the corner, the Blue Mountains. And, yes! Jenolan Caves are one of my top favourite attractions. They are truly spectacular! Magical! The caves are 340 million years old! 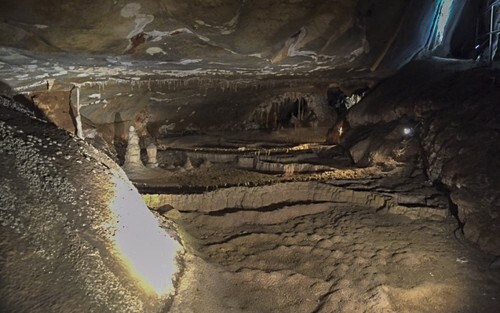 They have discovered more than 400 caves at Jenolan since 1930. If you are not good at directions, I strongly recommend that you check the section “Getting Here” section of the Jenolan Caves official website. There are recommendations not only regarding the directions, but also “where to get petrol”, “where to park” and “times of the day that you might need to take an alternate route”. The road is very narrow, so it is not suitable for caravans. Finally, the “Getting Here” section allows you to click a button that takes you to a page with information of the road conditions. It is always worth to check it, as you can find some “surprises” like road works or snow in winter! Check the Getting There section here. 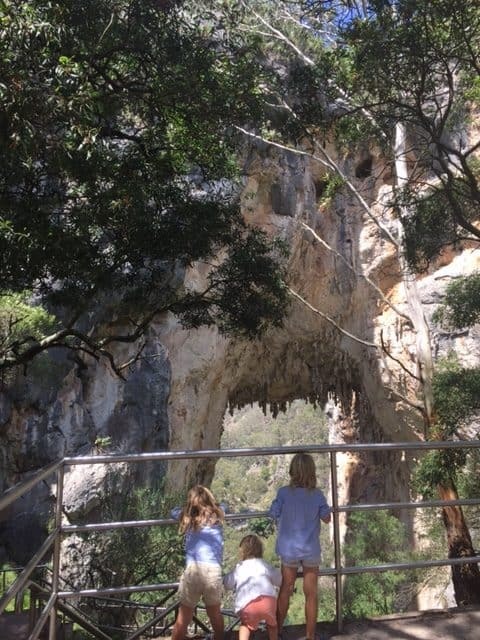 You can also easily take a tour from Sydney to visit Jenolan Caves. 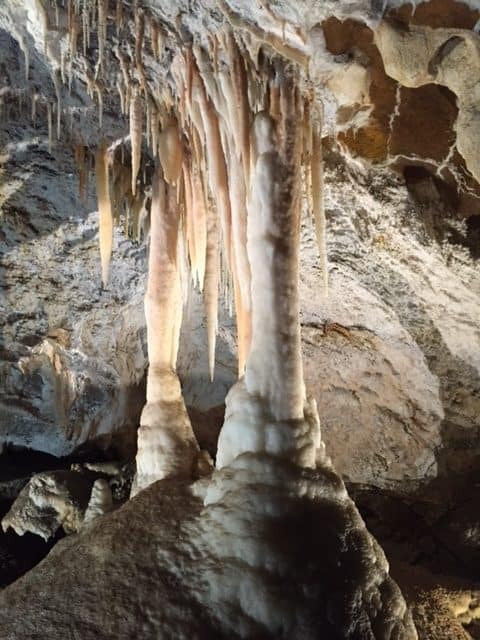 Read about tours to Jenolan Caves on the Viator website here. 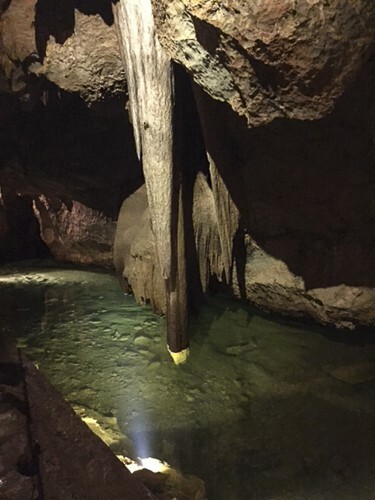 Ten spectacular show caves are open to the public. We chose the Imperial Tour, as it was the one recommended for young children. It is the easiest, it doesn’t have too many steps and it lasts around one hour. Our tour guide was amazing, good sense of humour, good communicator and patient with children. The cave formations are amazing. The spectacular lighting enhances the shapes and the colours of the limestone. Some of the features are ‘Ridleys Shortcut’, the ‘Alabaster Column’, and the ‘Crystal Cities’. However, my favourite spot was the underground river and the rock formation that looked liked a bacon rasher. If you have the chance to read the description of each tour, you will notice that each cave is different. 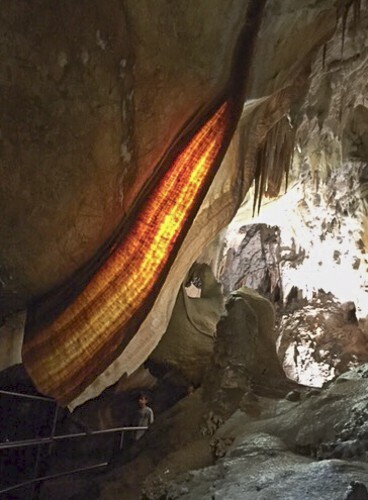 For example, the Lucas Cave has the Cathedral Chamber, one of the highest and widest at Jenolan. The Orient cave has the most bright colourful rock formations. And, the River Cave requires a good level of fitness (it is not recommended for children under six). Jenolan Caves also offers night tours, ghost tours and adventure caving. During school holidays, they offer special tours in the caves just for children. Finally, there are two self-guided tours in several languages, the Nettle Cave and Devil’s Coach House Cave. Both caves are open caverns, not enclosed. The Caves House at Jenolan Caves itself has a great variety of accommodation, from luxurious to backpacker. Read more about Jenolan Caves House and check availability and pricing here. Tickets – Very important: The website contains information of the prices, but it does NOT allow you to book the tickets online. When I talked to the ticket office some months ago, I was told that they are planning to offer this service. But, it hasn’t happened yet. To avoid disappointment, book the tickets over the phone in advance. These caves are very popular. Tour tickets tend to sell out, specially the ones in the morning. The website says very clearly: “ We apologise for the difficulty contacting us during these busy school holidays. If you would like to book a cave tour, keep phoning. We are trying to answer all the calls. Do not submit the above form or send e-mails, as we are unable to attend them currently”. Children’s ages: If you have very young children, you might consider going there when they are at school age. My children were five, three and one. But they are used to walking and hiking. To clarify: we are not experienced hikers. 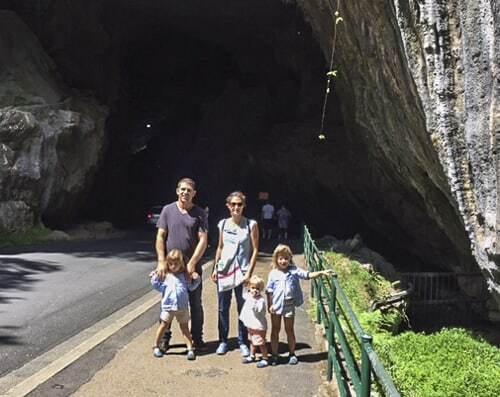 We chose the easiest cave and we carried our little one most of the time . 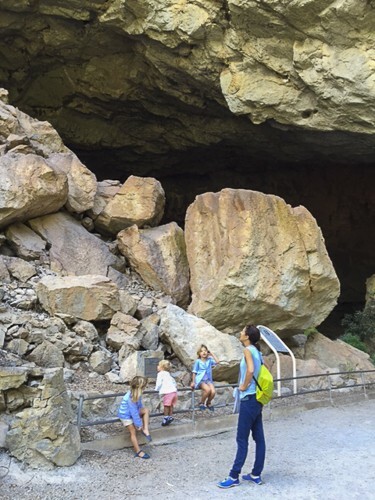 Jenolan Caves does not recommend backpack child carriers. There are sections that you have to duck down low. What to wear: Inside the caves, there are some stairs and it can be slippery. Remember to wear comfy shoes with some grip. They don’t have to be hiking boots; a pair of sneakers is perfectly fine. It was not cold inside the caves. According to the official website, it is always 15 degrees. Finally, I would recommend you check the forecast before you go, as it can be cooler than in Sydney. Toilets/Baby change: There are no baby change facilities in the toilets of the Jenolan Caves precinct. If you have little ones, be aware that there are not actually toilets inside the caves. The closest toilets to the entrance of the caves are the ones that are located next to the Ticket Office Building. Allow 15-20 minutes to go at least, before the tour starts. Cafe + Food: The Bistro Cafe is open daily from 8am until mid afternoon. They sell drinks, snacks, wraps, light meals, sandwiches, etc. Also, Chisolm’s Restaurant is open for breakfast and dinner. Bookings are essential for dinner. We did not eat in there, but apparently Chisolm’s Grand Dining Room at the Historic Caves House is like travelling back into the past. If you prefer to bring your own food, there are also several picnic areas. In the ‘Cambridge’ and ‘Carlotta’ car parks, there are free gas barbeques. 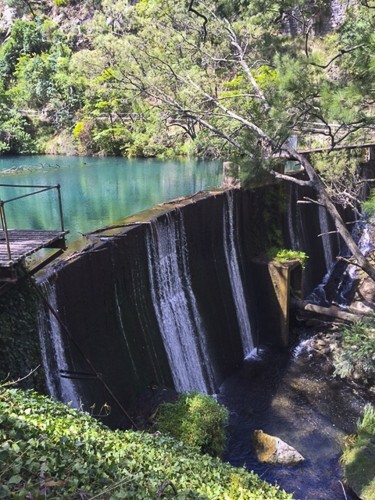 Walks at Jenolan Caves: There are several walks that you can do to extent your day trip or your stay. We did the Blue Lake loop, which is very easy. It was perfect to kill time before the start of the tour of the Imperial Cave. The blue lake was so blue that it even did not look real. So blue! that it could be part of a fairy garden or part of a Van Gogh painting. We also did a section of the “Carlotta Arch Walk”, when we came down from the car park. This one has some stairs, so you might end up with muscle ache if you are not fit. The Carlotta Arch is stunning. It is so big, so imposing! Other bush tracks are the “Jenolan River Walk”, the “McKeown’s Valley Track”, the “Devil Coach House Lookdown” and the “Six Foot Track”. Besides the itineraries, there is a mobile application that you can download from the official web page of the Jenolan Caves. NB: There is no wifi in Jenolan Caves. Therefore, I strongly recommend that you plan your trip in advance!!! This is one of the trips that your children will remember forever. My husband went there when he was ten years old, and he stills has clear memories of the caves. Definitively, the long drive is worth it, if you decide to go there for the day. Thank you so much Mireia, it’s a pleasure to read about your visit! This post contains some affiliate links. If you purchase an item using these links Hello Sydney Kids may receive a small commission, at no cost to you. This helps support the blog. Disclosure policy is here. Absolutely beautiful! A trip there is truly a get-away from the digital world as there’s no wifi which is great! I have Two young kids – 16 months and 4 year old. Will walking /trekking be an issue? We Babywear so might be able to carry littler one on our backs. Should I sign up for a tour? Which ones do you think are a must do? This is the tour that we did with our children. I highly recommend that you book this tour in advance. As it is the easiest one, it can be very popular, specially during school holidays. I believe that my children were similar ages than yours when I wrote the review. I would say, if you have a 4 year old that walks well, meaning that he/she is capable to walk a far a bit and he/she has good balance, you should not have any problems. Dress him/her with trainners, that have better grip than the sandals that my children were wearing. You can always hold her/his hands in the narrow sections or steps going down. Regarding your 16 month old, if it is a toddler that likes walking allow him / her to explore holding his/her hand, too. When he/she is tired, you will have to carry her/him on your arms, as babycarriers are not recommended. This is what we did with our ones. 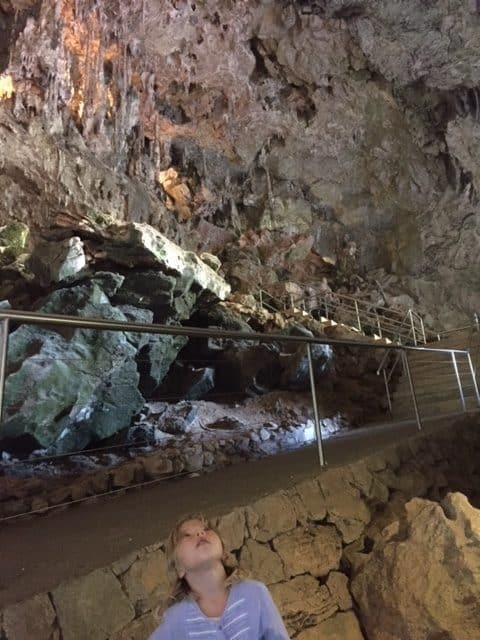 Can I take a baby pram or stroller in the caves? No. 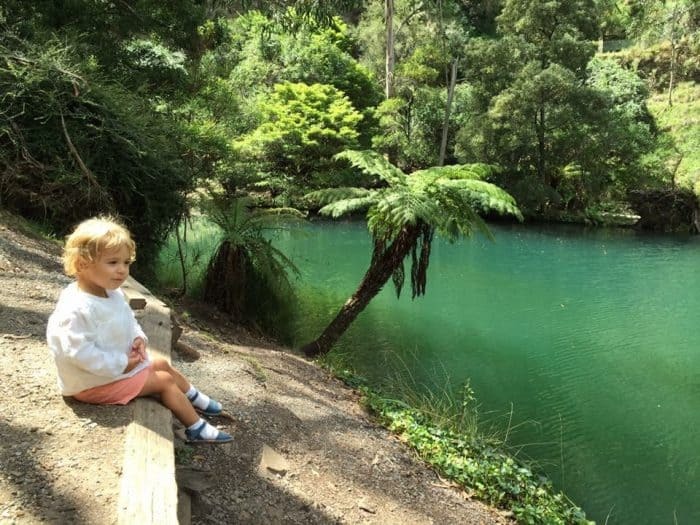 You cannot take a pram or stroller through any of the caves at Jenolan. Also, we strongly recommend that you do not use backpack child carriers on cave tours. Besides the Imperial Cave, you can choose the walk that takes you to the stunnnig Blue Lake or the impressive Carlotta Arch. The Carlotta Arch walk has some steps. Again, it all depends how fit you are. But I would say that they are not difficult walks. You might have a bit of muscle ache next day. In conclusion, if you are unsure about the abilities of your children, just book the Imperial Tour. I think that it is an excellent day trip and if you live in Sydney, you can always return and do another tour when the children have grown a little bit more. I hope that you enjoy the excursion! We had a great day out. Hello, I just got off the phone with Jenolan Caves staff, and went through to 4 different people, no one knew about the ‘school holidays, offering special tours in the caves just for children.’ Just went around in circles with them, I took my kids to many of their caves over the years and now want to take my grandkids (4 & 6) who are at a lovely age to get the full adventures of the caves, but the people who answered the phone today were not helpful at all. Sorry to ask, but did the special ‘school holiday tours’ have a name, maybe that will ring a bell for the guys at Jenolan Caves? Do try this one, I will try it again later too. My parents are visiting us from Japan next month so I’d love to take them to Jenolan Caves which I’ve never been. I have 3 kids, 6 yo, 4 yo and 10 months old. Do you think it’s not good idea to go there with baby? I understand they don’t recommend back pack child carriers, which mean carry at the front is ok? Best to give Jenolan Caves a call to ask about this, we think. Then you can explain your exact circumstances.